Moraga, Calif. • One of the most startling facts about BYU’s eight-year existence in the West Coast Conference is that the Cougars have had less success at Saint Mary’s than anywhere else in the league, including nationally prominent Gonzaga. That run of futility continued Saturday night, as the middling Gaels walloped the also-mediocre Cougars 88-66 in the usual early-season conference matchup of teams that always seem to be looking up at the Zags in the league standings. “What a difference a couple days makes, huh?” BYU coach Dave Rose said, alluding to how well the Cougars played two nights earlier at Pacific as opposed to another clunker in front of an announced crowd of 3,500 at McKeon Pavilion. While acknowledging that BYU’s defensive effort left a lot to be desired and shots the Cougars (1-1, 9-8) normally make just weren’t falling, Rose surmised that playing a fifth straight game away from the friendly confines of the Marriott Center caught up to BYU as well. “We get behind, and we are trying to play from behind, and we get a little bit too quick offensively, trying to score quickly, and we have problems,” Rose said. Saint Mary’s improved to 1-1 and 10-7 and leads the all-time series 14-13 after losing badly to BYU in last spring’s WCC tournament semifinals. The Cougars were competitive the first 15 minutes, then buckled the final five minutes of the first half and could never recover. TJ Haws and Yoeli Childs combined for 41 points for BYU and Nick Emery added 11, but no other Cougars had more than five. 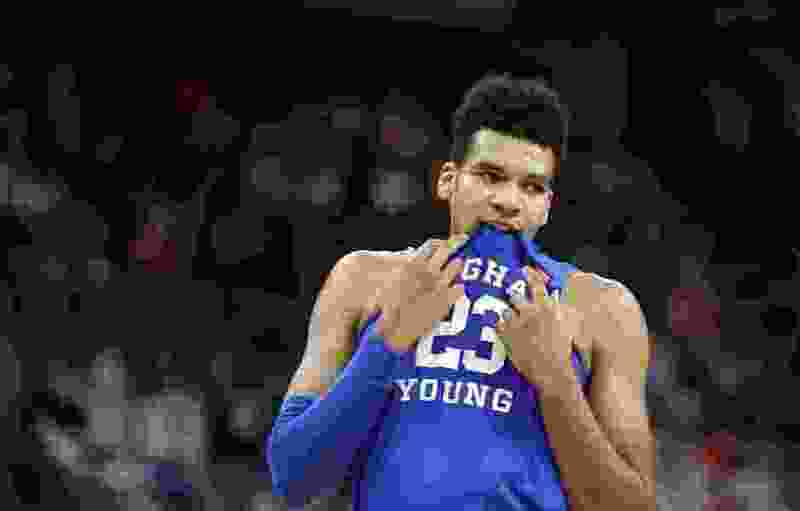 If there was a bright spot for BYU, it was that Emery seems ready to step up and be the third scorer the Cougars desperately need. “Saint Mary’s is a really tough team to play when they get ahead,” Childs said. The Cougars’ leading scorer had just five points in the first half and said he wasn’t aggressive enough offensively. “I was atrocious in the fist half,” he said, after finishing 8 of 15 from the field with a late rally. SMC officials usually do all they can to ensure BYU’s numerous fans in the Bay Area don’t overtake their tiny gym, and Saturday’s promotion to curb that was the distribution of Matthew Dellavedova garden gnomes to the first 1,000 fans through the doors. Coincidentally, the last and only time BYU won at McKeon was the night the school retired Dellavedova’s jersey No. 4 less than a year after the feisty guard from Australia played his final game in Moraga. No such luck this time around. BYU last beat Saint Mary’s here in 2014 by a 60-57 count, the only time a Rose-coached team has won in the tiny gymnasium nestled in the rolling hills east of Oakland. Rose was prophetic when he said after BYU beat Pacific 90-87 Thursday and SMC lost 76-72 at San Francisco that SMC coach Randy Bennett’s teams never lose twice in a row. Six-point favorites, the Gaels got 23 points from creative, sneaky guard Jordan Ford and shot 55 percent to improve to 7-1 against BYU here since the Cougars joined the league. SMC’s Tanner Krebs scored seven straight points to open the second half and the Gaels kept rolling from there. He finished with 14. After a herky-jerky start by both teams, Dalton Nixon’s free throw with 5:44 remaining in the first half tied the contest at 25-25. Then South Florida transfer Malik Fitts, a 33 percent 3-point shooter, hit three straight treys to give the Gaels a sudden 34-27 advantage. Fitts added a couple buckets in the second half when BYU was threatening to cut into the big lead and finished with 18. “Credit to him. He was just making plays,” said BYU freshman Connor Harding, BYU’s fourth-leading scorer with a measly five points. Ford’s 3-point play made it 42-29 and BYU almost went the final four minutes of the first half without scoring, but Haws drained a buzzer-beating 3-pointer from 35 feet or so to get the Cougars within 10 at halftime. BYU returns to the Marriott Center for the first time in nearly a month on Thursday when it hosts Portland at 7 p.m. MST.